When you need dependable, quality heating & air conditioning repair, service or installation in Provo, you can turn to Best Heating & Cooling. We offer a large selection of quality HVAC products and our heating & air conditioning technicians are trained and ready to help when you have any problems with your heating & air conditioning equipment. Whether the issue is with your furnace, air conditioner, heat pump, ductless mini-split or another HVAC equipment in your home, we can help. We are a family-owned and operated heating & air conditioning contractor that is proud to serve Provo and Utah County. 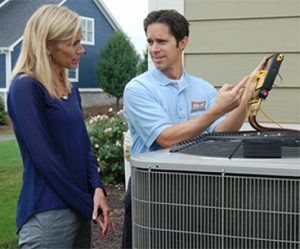 We work hard to maintain a reputation for providing quality heating & air conditioning service and products to our clients. When your heating system stops working on a cold winter day, we know you want to get it repaired quickly at a fair price. Our heating repair experts can service, install and repair any brand, make or model of furnace, heat pump or residential heating system. Whether your furnace is making an odd noise, needs tune-up, or has stopped working altogether, Best Heating & Cooling is the heating contractor Provo residents can depend on. Are you experiencing problems with your air conditioning system? Give Best Heating & Cooling a call now! Our friendly air conditioning repair technicians have the training and experience to diagnose and repair any make and model of air conditioner, heat pump, ductless mini-split or air conditioning system. Whether you need emergency air conditioning service on a hot summer day or just need an AC tune-up, we have you covered. Our goal is to continually raise the standard for excellence and superior customer satisfaction. Our many years of experience in the industry, combined with our comprehensive heating & air conditioning training, give us the theoretical knowledge and practical skills to solve your indoor comfort issues every time.